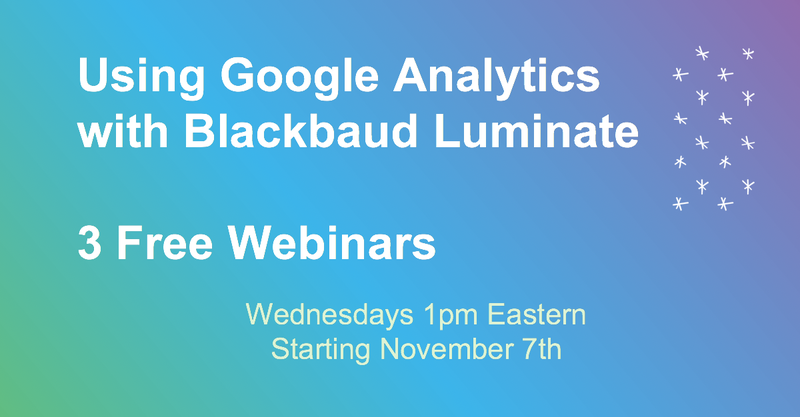 Three free webinars on how to make the most of Google Analytics and Blackbaud Luminate. A follow up to my 2018 Blackbaud Conference session. Earlier this month I presented a session at the 2018 Blackbaud Conference (BBCon) in Orlando. The session looked at how use Google Analytics to measure and optimize the performance of your Blackbaud Luminate site, and I co-presented with Brenna Holmes. The conference was a series of firsts for me. It was my first time in Florida. It was the first time my plane had to fly around a hurricane to get home. And it was the first time I realized I had to do a follow up session once I got home from a conference. There was a lot to cover in our hour long session, where we showed people how Google Analytics could help them raise more money and engage more followers online. From the questions after the session, I realized that people would benefit from a follow up session that got into the details of exactly how to make the most of Google Analytics for their Luminate site. So here are those follow up sessions. Wednesdays November 7,14 and 21st. 1pm Eastern, 10am Pacific. If you have used Google Analytics and Luminate, you know there is a lot of complexity to both of these tools. These webinars are designed to show you the shortcuts to getting fundraising and follower engagement insights with these two platforms. Over the past 6 years of working with Google Analytics and nonprofit clients, I have learned that there are three key steps to getting the most out of Google Analytics. If you’re struggling with making sense of Google Analytics and how it works with Blackbaud Luminate, you’re probably missing one or more of these steps. I will walk you through each of these key steps below, to make sure you understand how to get the most out of Google Analytics with your Luminate website. We will make sure you are sending the right information to Google Analytics to track donations and email signups. This involves using a free technology called Google Tag Manager to customize your tracking to your needs. This will be covered in webinar 1. You are already using Luminate source and subsource codes to track your web traffic (right?) We will look at Google Analytics campaign tags, also called UTM tags, which work much the same way to help you understand the impact of your ads, email and social media. This is the focus of webinar 2. Google Analytics has some solid standard reports, and we will cover those in our final webinar. Google Analytics becomes much more valuable when you combine advanced segments, dashboards and tools like Google Data Studio so you can quickly share data and insights with your team. We’ll look at how to use each of these to prepare you for the follow up to Giving Tuesday – Reporting Wednesday. Webinar 3 will cover this final topic. These webinars are free to the first 25 people who sign up, even if you didn’t make it to BBCon 2018. (It was near Disney World, what’s not to love? )Â Recordings of all sessions will be sent to anyone who has attended at least one of the live webinars. If you can’t make ANY of the sessions, email me and we can discuss. Posted in Google Analytics How To and tagged Blackbaud Luminate, webinar by Admin Person.